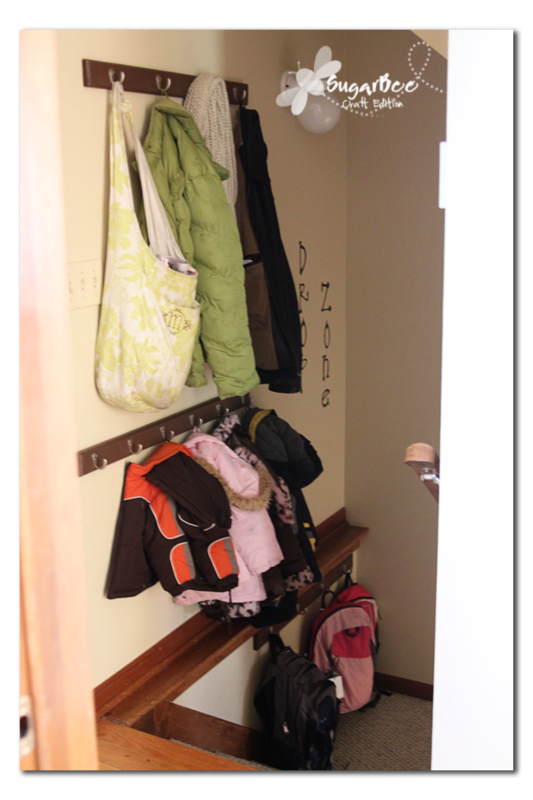 When we moved in our house a few years ago, we decided to put some hooks in our laundry room and have it double as a mud room. Lots of people do that – so I thought it’s what you do. 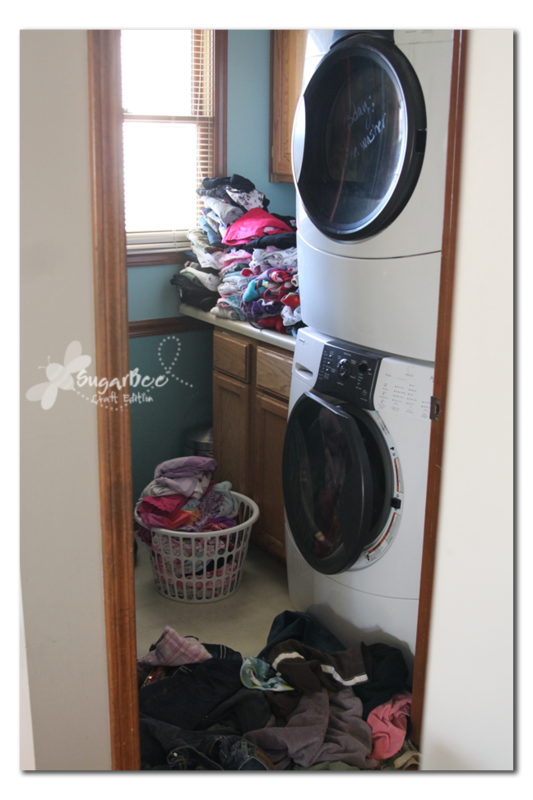 Our laundry room is by our front door and garage door. So we added a few hooks. But it never worked well – for years. Because it’s not much of a room – it’s as big as you see – the hooks are on the wall opposite the cabinets, but it’s not like there’s a nook or anything, so it’s pretty small. –I like to spread out and make piles on the floor – darks, colors, whites, etc – it takes up room – – can you imagine trying to do that while stepping on coats and backpacks – ugh! Plus people tromping over laundry to get to coats. –the hooks were just in the wall – sheetrock – and they pulled out. 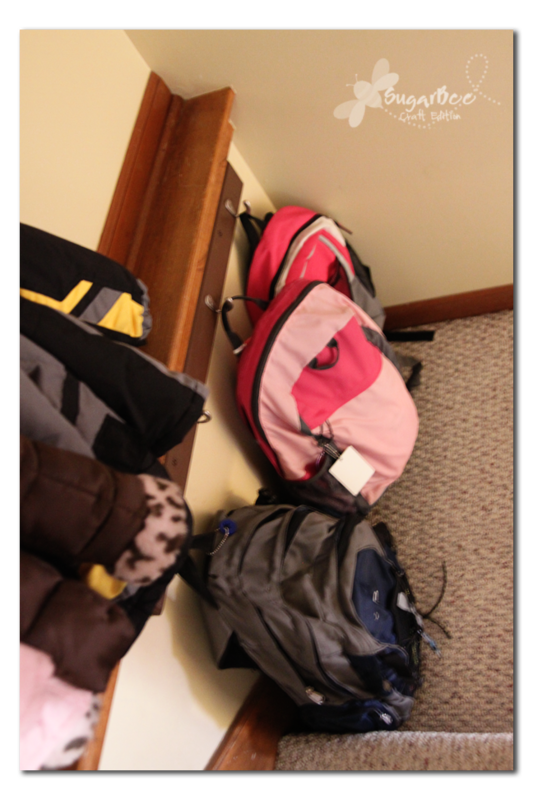 Hence a lot of coats and backpacks on the floor. 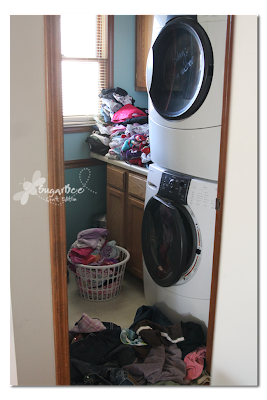 Here you can see where our laundry room is – this view is from inside looking at the back of the front door. As you can see, the stairwell has the same location benefit as the laundry room – near the front door and the garage. 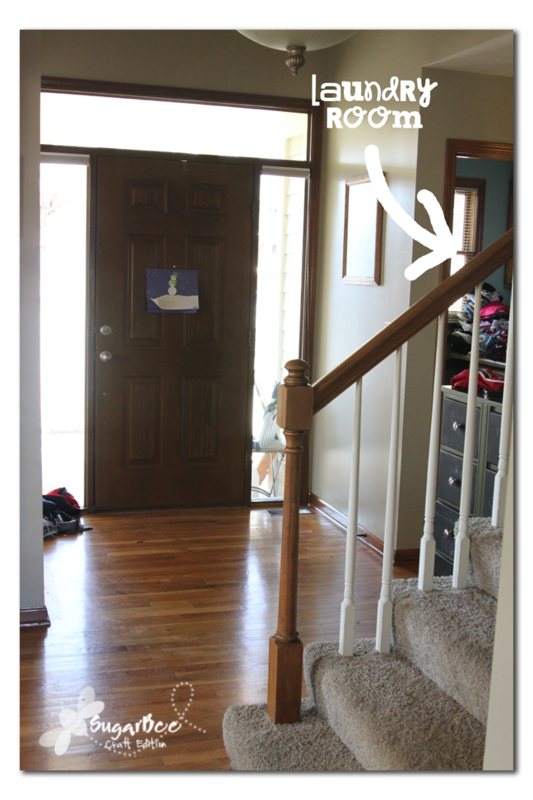 Our basement stairs are the “L” type – they go down a few steps, then there’s a landing, then they turn and go down the rest of the way. The landing was the perfect spot. –the hooks are in a board – so they’re not going to pull out. –LOTS of hooks – one for each child and each adult, plus extras on each level, for kids’ friends and my bag (which used to just get chucked into random places throughout the house). 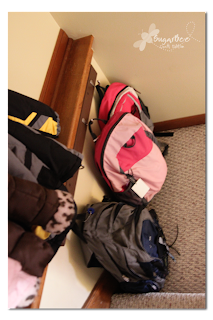 The backpacks kind of rest on the ground while they’re on their hooks – and again, one for each child. I was just looking at these types of hook boards yesterday at Lowe’s! Where did you get yours? That looks amazing! I am always struggling with how to handle the backpacks and coats! Love your idea! I’m your newest follower from the Boost your Blog hop. I love crafts! Your layout is too cute! 🙂 Look forward to future posts! I like it! I’m going to have to bookmark this one for our next move. Love the drop zone! What a great idea having hooks on every level. The whole coat closet thing doesn’t work for us either. 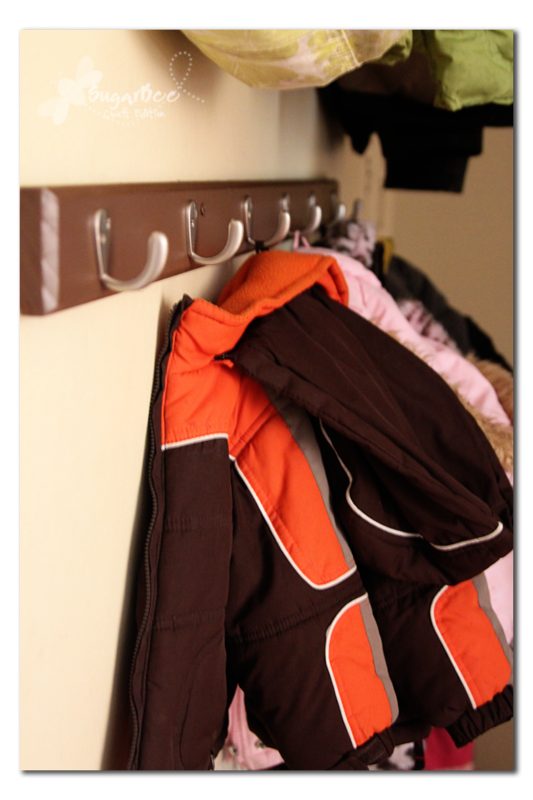 We have two coat racks hung like that by our door, too. I love your backpack rack below it! Good idea! ~So I thought I had been following, but blogger says not…so now I am 🙂 Happy Monday! I love this Mandy!! 🙂 Looks great!! What a great idea! 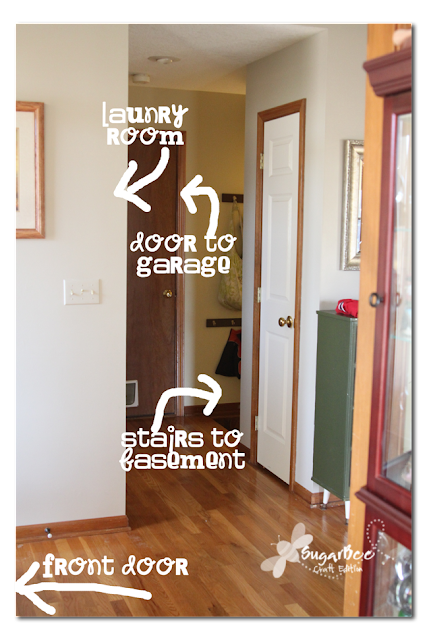 We have stairs, laundry and garage door (the one we use most) all together, too–hmmm…thanks for your fabulous idea! Wow, this brought back a flashback to my childhood. 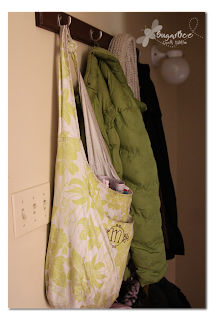 We had an L shaped staircase at our backdoor and we had hooks just like this. I hope it does the trick. 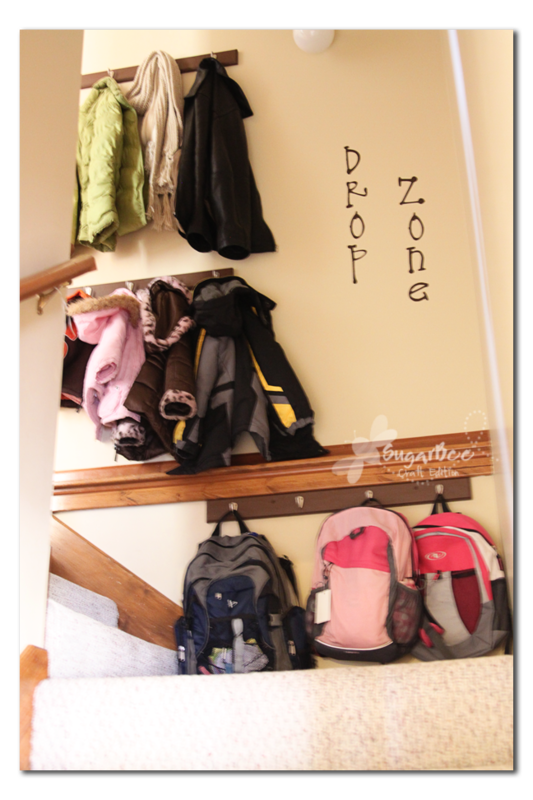 We have a huge mud room with tons of hooks and those darn backpacks and coats still make their way into the house. What a great Idea! Love that there’s nothing to trip over! How many times a day do Moms yell out ‘Someone’s going to break their neck tripping over all this stuff!’ Good for you! Oooh, love it!! We live in a very small house and don’t have the luxury of a mudroom. 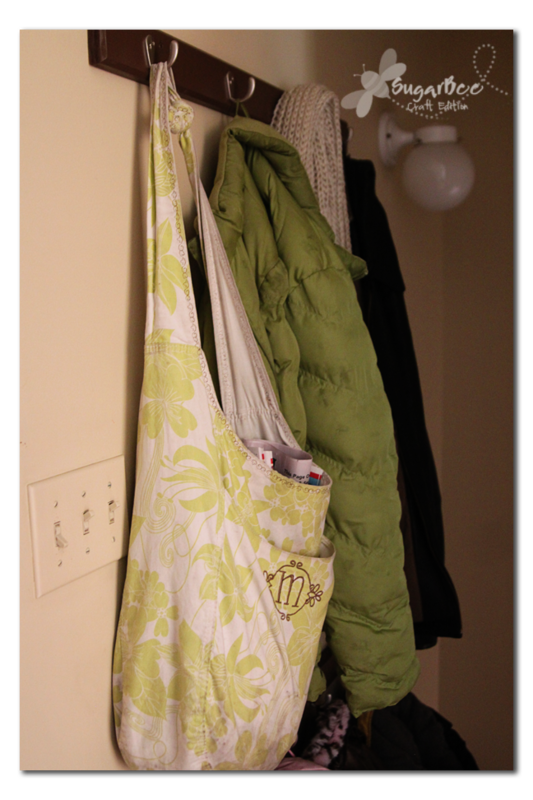 I’ve been toying with the idea of hooks in our stairwell. Thanks for the photos – love it! Love this idea….too bad we don’t have stairs…or a good place to put this! Hooray for functionality; this looks great!